I have a young mind and I’m proud of that. As we used to say a thousand years ago, I’m hip. But lately I’ve noticed my brain occasionally slips a cog and loses its place. I just wrote a check and dated it 3-14-75. March 14, 1975 was 44 years ago today. I have no memory of that day being significant in any way. As far as I can tell it was just one normal day among the 24,837 I’ve enjoyed so far. Just this morning I was telling a much younger friend at work that I have a young mind but my body is going to hell. Now I’m thinking my brain may be limping along quickly to catch up. I like to believe that brain farts come from trying to sort too many wonderful memories mixed with meaningless combinations of old dates and images, all stuffed into the same leaky mental file box containing a glorious lifetime of days. 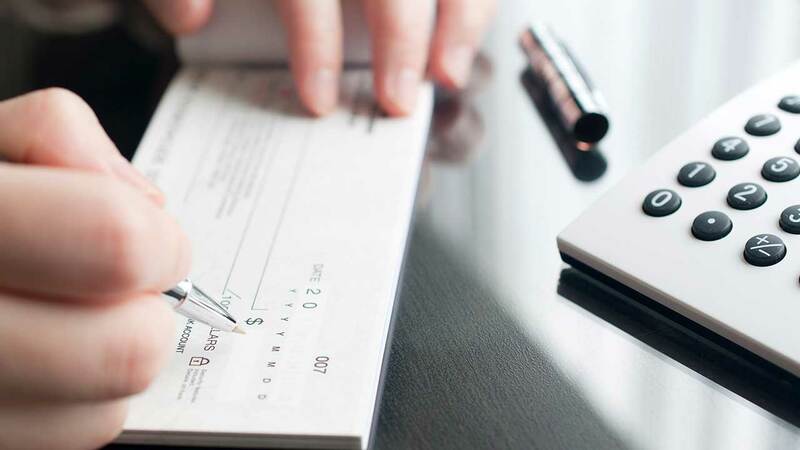 One thing I know for sure is that you people who still insist on a handwritten paper bank draft (a check) should catch up with the rest of us and accept digital payments. You’re embarrassing yourself and confusing me. And now I’ve lost my checkbook. I’m not writing this because I’m worried about my cough. I’m just taking note of this moment in my life. 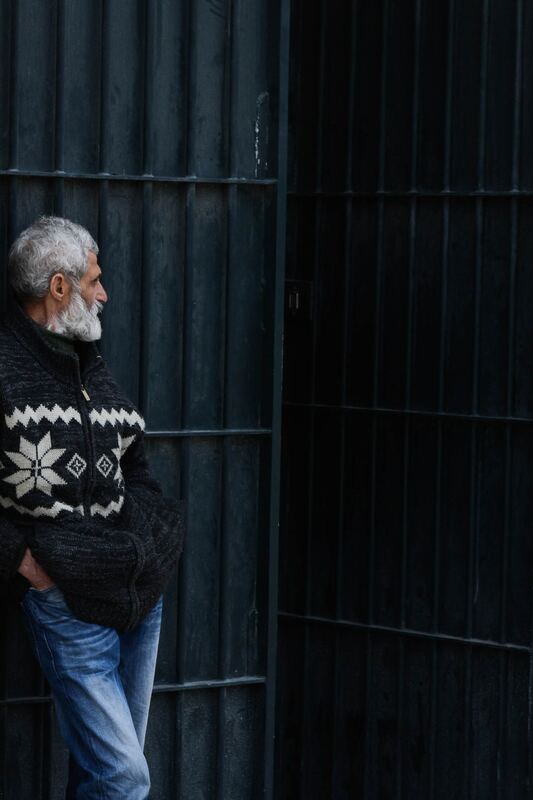 At 67 I’m experiencing something totally new: the unexpected idea that I may be entering an age of increasing infirmity, of nagging pains and niggling problems that I might have to drag around to the end of my days. I rarely get sick, not even a cold, but suddenly I’m starting to feel a bit frail for the first time. Coughing wears you out and makes you think. Roughly 40 years ago I suddenly realized that I would never play baseball again. Real baseball, I mean. 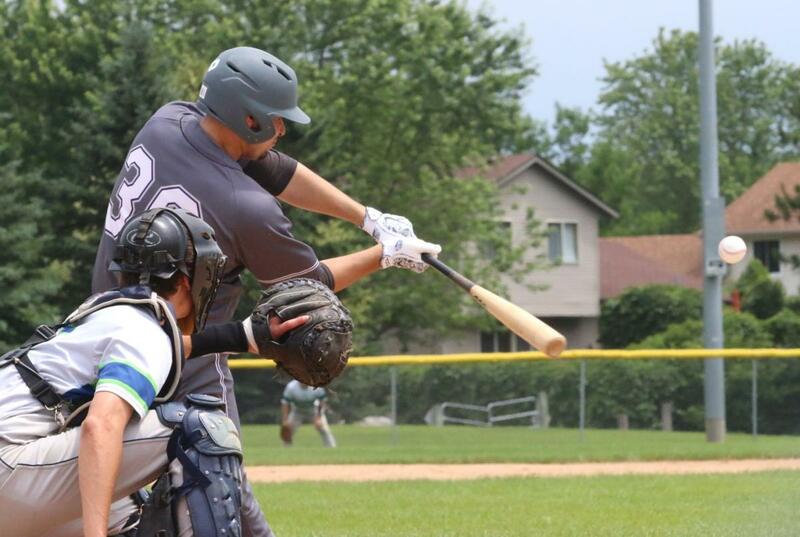 Unwillingly I made the transition from hard-breaking fastballs to the high arcing lobs of a bigger, softer target. Slow-pitch softball is fun but it’s not baseball. Now, a couple of decades later I miss them both. About 20 years ago I was suddenly relieved of the daily responsibility of parenting. Our oldest son was married and our youngest son had just moved out. CarolAnn and I celebrated our freedom as new empty-nesters. We loved it yet we missed having children in the house. Family time became the two of us time, which is wonderful though still bittersweet. We will always miss our boys. There have been other life transitions of course, less notable and too numerous to mention. The thing is, after nearly 70 years of living I’m starting to see a pattern, a constant ending and renewal of a single life’s experiences and perspectives. In 1984 author Gail Sheehy kicked off her enormously successful series of books about the subject she called Passages. From toddler hood to old age we who are lucky enough to live long lives are constantly saying goodbye to one time of life and entering the next with some trepidation. That’s the excitement of the journey. With great luck, or by design if you prefer, life is a very long road of wondrous yet worrisome discovery. Lives are lived as chapters of precious stories belonging to the world and yet as unique as ourselves. I don’t miss baseball as much as I did 40 years ago. And frankly, though I will always enjoy memories of having our boys at home, I’ve gotten over wistful nostalgia pretty well and cherish my daily solitude with CarolAnn more than ever. This cough is forcing me to hire a younger man to do my yard work. I hope that’s just temporary but the fact is I may never mow a lawn again. That seems trivial but I’m starting to miss trivial things as well as the big, profound stuff. At the same time I’m learning to shrug off the life I’ve known for whatever surprises come next. We all are. Life is a kaleidoscope. Every slight turn brings a shift in perspective and a dazzling new view of the world we’ve always held. If this all sounds a little loopy, just blame the meds. I don’t remember when I first realized that I was never going to be special. I don’t mean as a person. I’m a good guy and I’m proud of that but when we’re very young we imagine a world of glory and achievements just waiting for us to arrive and pick them up as fate has arranged. As kids we’re told we can be anything we want to be. It’s a lovely lie. I wanted to be a major league baseball star. I daydreamed about it for years and played the game joyously. I was good, too. I could hit the ball a mile but at some point I suddenly understood that hitting World Series winning home runs would always happen only in my imagination because I could never be good enough to play center field for the Giants. The seed of doubt was planted in me early. Fourteen or fifteen, maybe. I wanted to be a professional actor and as a young adult some pretty knowledgeable people told me I was good enough to get better and succeed. I’m still not sure what stopped me from trying. Fear of failure, I guess. Though, my wife, the lovely and feisty Carolann Conley-Williams, says I actually fear success. It’s an interesting possibility. And that’s where I am now: 67 years old, most of my futures behind me and sometimes still wondering why I’ve carried self doubt with me through a lifetime. I’ve had a very good radio career. I’ve worked morning shows in major markets and learned my craft as well as anyone in the business. I say that with expert objectivity. I’m very good but I’m not great. I can write but I don’t. I want to but I don’t burn for it. Writers always say they write for their own satisfaction but I think that’s a nifty bit of self deception. What’s the point in writing if lots of other people don’t read your work and love it? Writing is hard, lonely work fraught with doubt. I describe myself in social media as, “Happy husband, proud dad and grandpa, unrepentant underachiever.” I wrote it to be charmingly humble but it has suddenly dawned on me that it’s true. I am an underachiever in one sense but I love my life, every bit of it. I wouldn’t change a thing. Not one instant. Pushing 70 I’m beginning to understand that finding glory in one’s ordinariness can be a deeply satisfying thing. My old friend, doubt, brought me here. 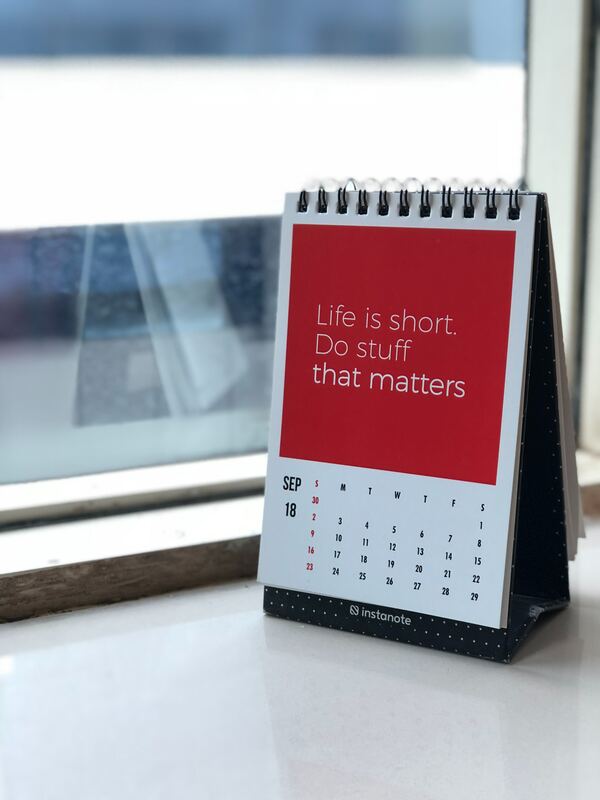 Pictures courtesy of the free online photo share source, Unsplash.com. I learned nothing from my upbringing about aging gracefully. Mother’s only advice about the passing years was to encourage the use of more moisturizer so boys will like you. My friend Anita wrote those words in her blog earlier this week and it made me think about my own upbringing. My parents taught me small things about washing dishes and how to work a slingshot. Mom taught me to scrub my face with Phisohex to wipe away teenaged pimples. 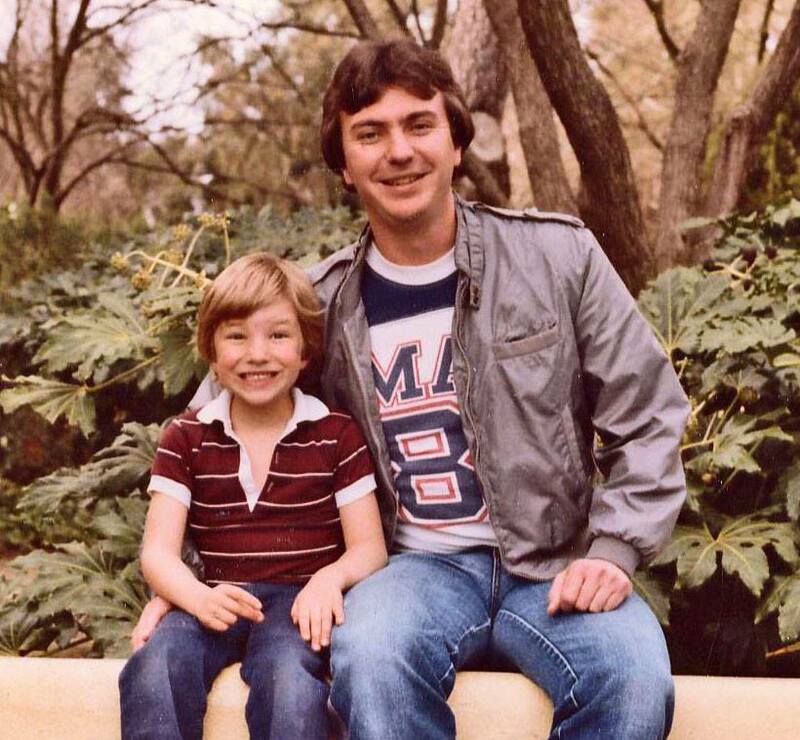 Dad taught me to stand up straight and look a man in the eyes when I shook his hand. Neither of them talked to me about girls or careers and retirement. I didn’t even get the birds and the bees talk. 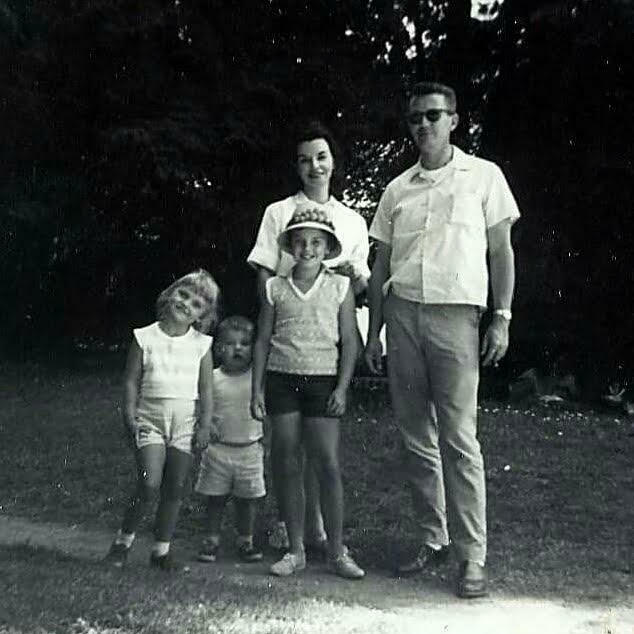 My parents, like Anita’s, left me to learn the deep, quiet lessons of life in my own good time. They taught me to be honest and respectful and that was pretty much it. Matters of my future and relationships were not theirs to teach. These days parents seem to be much more hands-on. They plan their kids’ lives from sunup to sundown, from birth to college and beyond. For all the stuff we read about helicopter parents and everyone-gets-a-trophy I don’t think parents today are doing anything wrong. It’s not mine to judge. The world seems much more complicated now than it was 60 years ago, though I don’t understand why. I do wish my grandsons could spend their free afternoons building forts in open fields with no grownups around. I wish they could ride their bikes home at sundown dirty, sweaty and wearing a freshly scabbed knee and simply be told to go wash up for dinner. Their world isn’t mine, I get that. But sometimes I still wish it was. 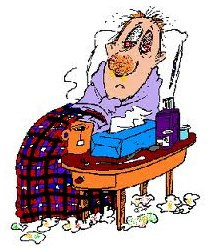 I have a lousy cold. It’s a terrible cold. You ever notice that people who have a cold almost always beef it up a bit with paralyzing adjectives that make it sound like an exceptionally bad cold, not just a “common cold”? This cold of mine is the worst cold in the history of colds. Trust me. Thirty years ago when I was still young, eternal and bullet proof I just ignored any illness that didn’t force me into a hospital. 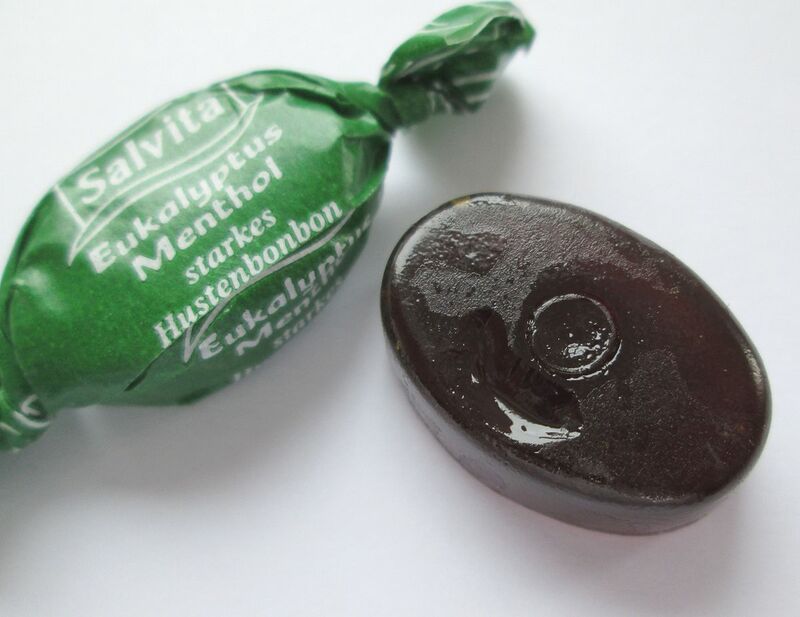 A cold? Flu? Please. It will go away no matter what I do or don’t do. That was my attitude then and it was proven correct time and again. I spent a lot of my 1980s evenings in a Northern California honky tonk wearing boots and hat and sucking on beer bottles, smoking Marlboros, chatting up the ladies and laughing with my friends. Don’t go getting all judgmental on me, it was a different time and socially acceptable. To say nothing of hella fun. In those days I learned that if I caught a wicked cold I could stay home, get plenty of rest, drink lots of fluids and I would gradually recover within a week or two. On the other hand, if I went out and smoked, drank, danced and laughed as usual it would take seven to 14 days for me to regain normal health, such as it was. Dancing and drinking and smoking cigarettes with a cold made the time pass much more quickly than shivering on the couch alone and feeling sorry for myself. We didn’t have Facebook or Snap Chat or Twitter in those days. Whining about a cold had to be done in person and your real life friends helped you get over yourself. 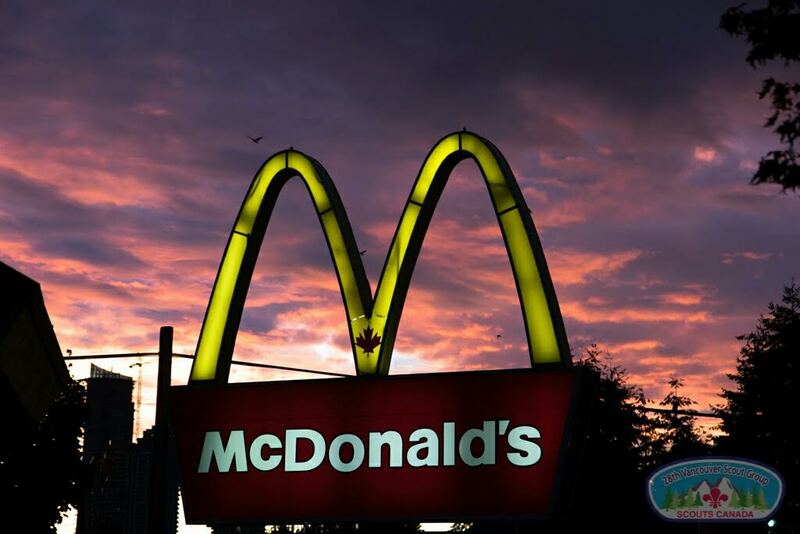 Sunrise at McDonalds. Burkburnett, Texas. You see them in every city and country village. 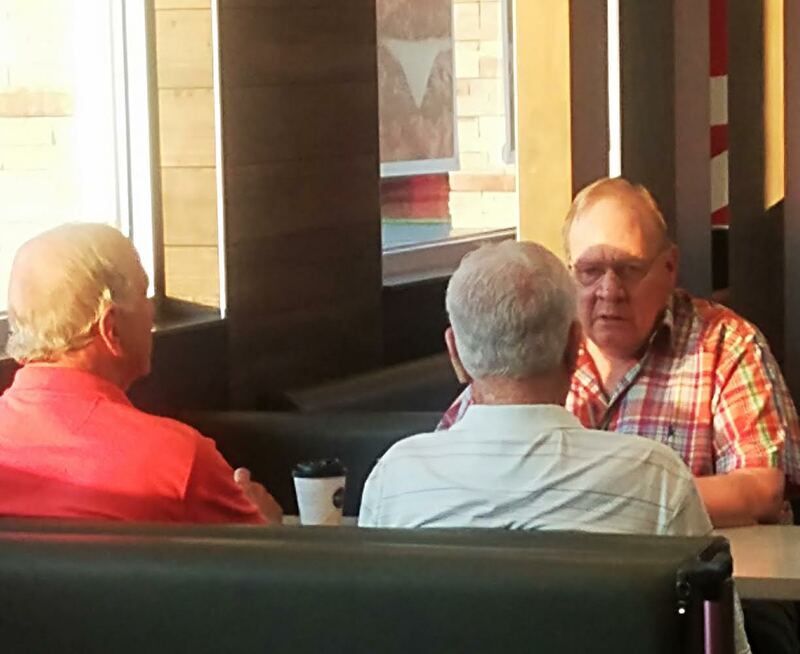 As sure as the birdsong of morning sunrise brings old men to McDonalds restaurants all across America. Before he passed away my dad was one of them. Most mornings he’d get on his bicycle at daybreak or hop into his old truck if the weather was bad and travel about a quarter mile to the nearest McDonalds. 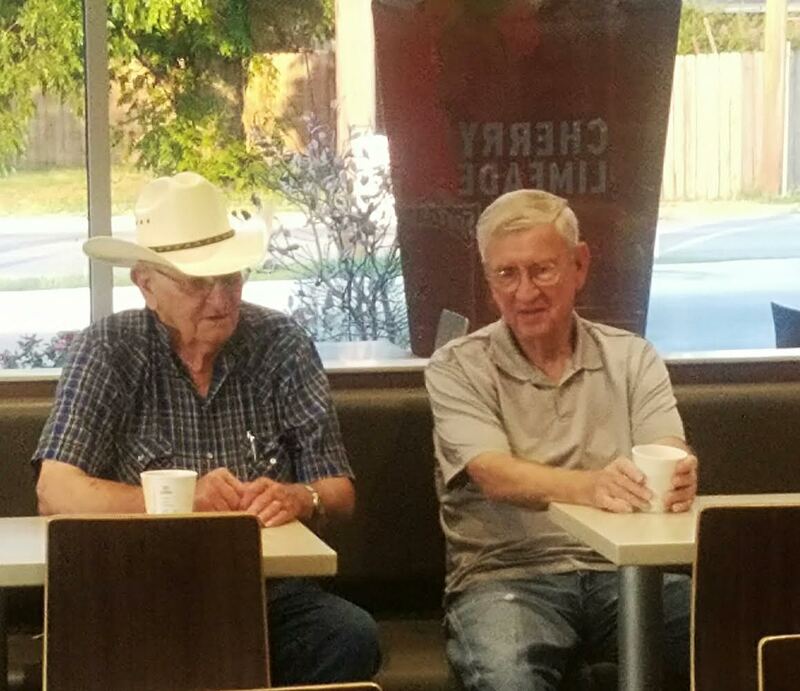 His buddies arrived about the same time and together they would grab a bite and drink coffee while solving the world’s problems for an hour or two. If you know me at all you know I have a deep respect and love for old people. 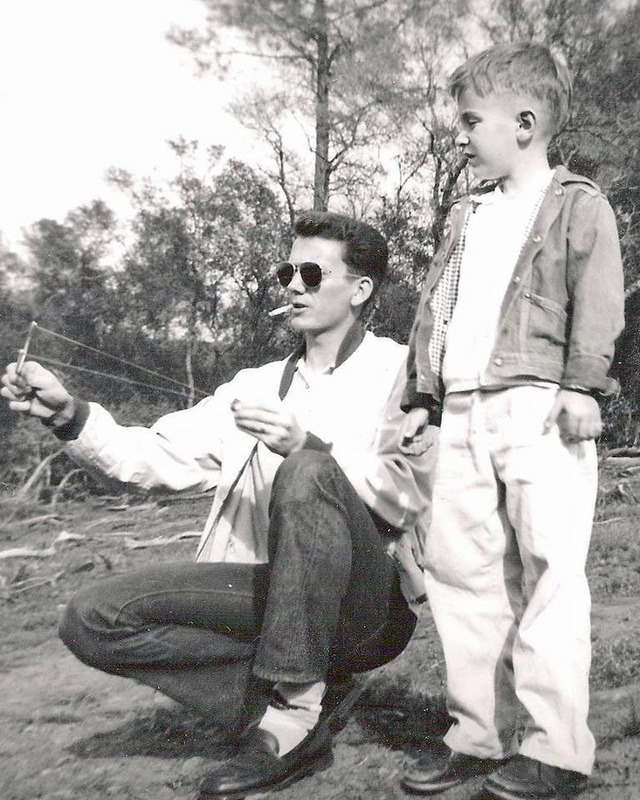 I’ve been that way since I was a child and asked my grandparents to tell me about their lives when they were young. Most of the time I got a quick smile and a dismissive comment like, “Oh, that was a long time ago. It don’t mean anything now. Go play.” Occasionally I’d get just a tidbit of information like, “We didn’t have TV” or “We didn’t have money for toys”. That’s not what I was asking but I got the idea they didn’t want to talk about it so I left the room to play. I’ve written often about how old people are overlooked and disrespected these days but as I get older myself, a month away from 67 as I write this, I’m beginning to understand there’s more to it. Sometimes old people just seem to lose the need or desire to be heard. I shouldn’t assume their silence is a sorrowful response to being ignored. Sometimes they’re just satisfied to keep their thoughts to themselves. This is another reason people don’t talk to old men, except other old men. It’s raining today in North Texas. I love rain and dark, cloudy days. Me slurping from our garden hose on a hot day. Most people I know worship the sun. They seem to like summer best of all and the hotter it gets the better. I don’t get it. 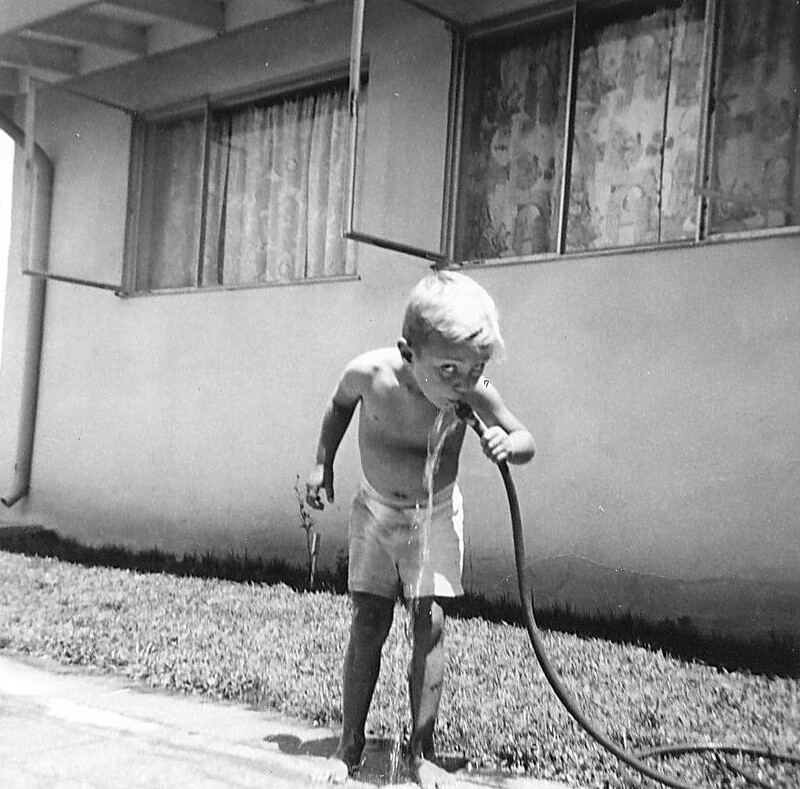 Summer was great when I was a kid, impervious to sweat and grime, running barefoot through neighborhood lawn sprinklers and slurping from any old hose lying around because that’s what they were for. We didn’t have air conditioning when I was a kid. We had a swamp cooler on the roof that blew semi-cool, very humid air directly into the middle of the hallway between the living room and kitchen in our house. I used to lie my bare tummy on chilly asbestos tiles right under the swamp cooler, wearing nothing but a pair of shorts fashioned by my mother’s scissors applied to an old set of blue jeans. 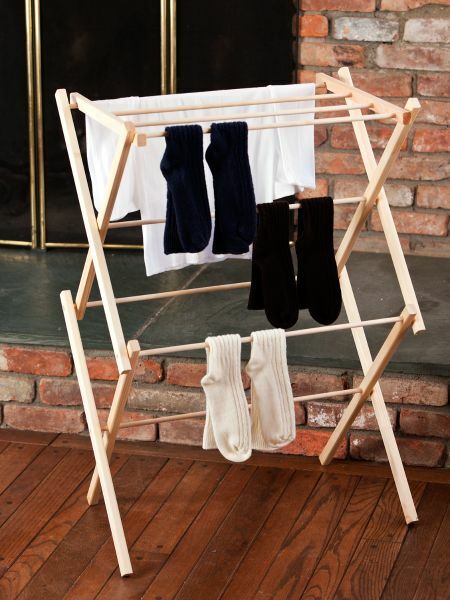 A new picture of an old wooden clothes rack like the one we had in the hallway. I stayed there for hours on the hall floor with a stack of Dennis the Menace and Sad Sack comic books for entertainment. Sometimes I took the pillow from my bed and put it on the floor next to my comic books. That was “the life of Riley”, as we called it in those days. Mom had to step over me to hang wet laundry on the clothes rack She didn’t mind. Sometimes she gave me my lunch there, peanut butter and grape jelly on Wonder white bread. I had to eat it fast so it didn’t dry out from the wind. 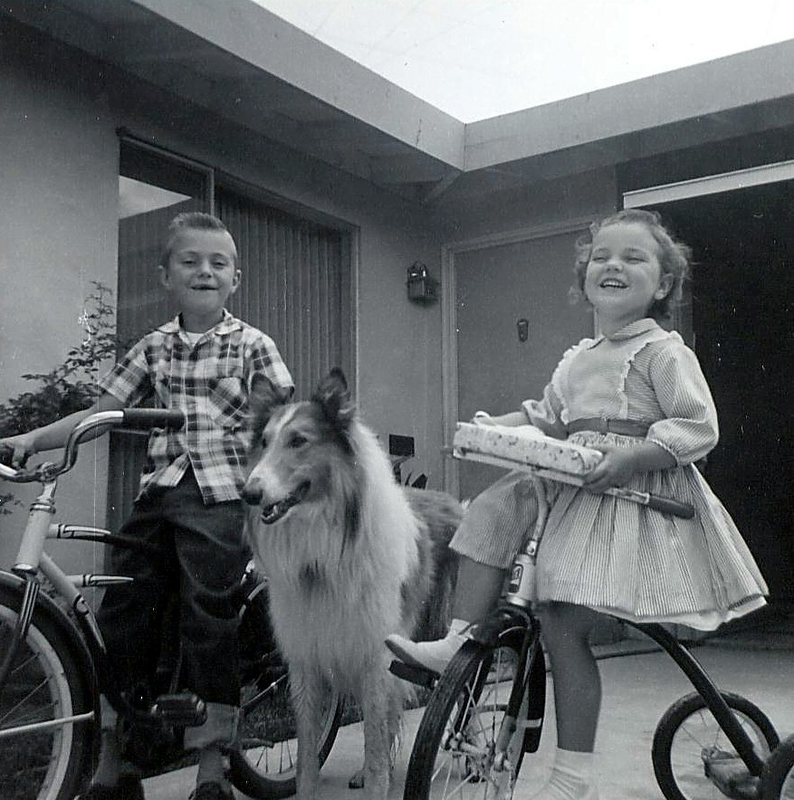 Me with my sister, Linda, and our faithful collie, Rusty. I wish I had pictures of all these things: me, my pillow, PBJ and comics. Sometimes my collie, Rusty, would lie down with me for a couple of minutes. He liked the cool floor but I don’t think he cared for the overhead wind. For the past fifty or more years I’ve been able to enjoy and expect indoor air conditioning. Now in my mid-sixties I don’t need to strip down to my shorts and lie on the floor under a swamp cooler. I still like summer for its memories of all-day baseball, ice cream trucks, slip ‘n slides and hot days that wouldn’t end until bed time. I loved childhood. These days I prefer old man comforts, winter and the temperate yet crazy weather days of spring and fall in Texas. Dark skies and rain feel cozy to me. They call people like me pluviophiles. I’m glad they have a name for it. I just thought I was weird.